New revelations about Brazilian military violence offer an opportunity to reflect on Canadian support for that country’s 1964 coup and how Ottawa’s policy towards our South American neighbour is similar today. A spate of international and Brazilian media have reported on a recently uncovered memo from CIA director William Colby to then US secretary of state, Henry Kissinger, detailing a meeting between president Ernesto Geisel and three Brazilian generals. At the 1974 meeting the new Brazilian president is reported to have supported extending “summary executions” of enemies of the military dictatorship. An army officer, Geisel ordered National Information Service head João Baptista Figueiredo — who would replace him as president — to authorize the executions. While it has long been accepted that the military dictatorship was responsible for hundreds of murders — a 2014 national truth commission blamed it for 191 killings and 210 disappearances — military backers have sought to put the blame on lower level officers. But the uncovered memo clearly reveals Geisel, who was considered more moderate than other top military leaders, was directly responsible for some deaths. Ottawa passively supported the military coup against elected President João Goulart that instituted the 1964–85 military dictatorship. “The Canadian reaction to the military coup of 1964 was careful, polite and allied with American rhetoric,” notes Brazil and Canada in the Americas. 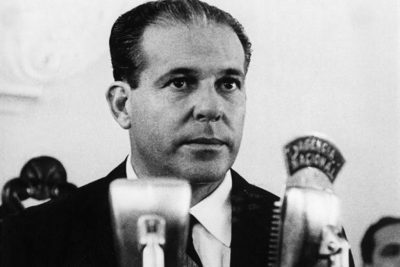 Prime Minister Lester Pearson failed to publicly condemn the ouster of Goulart. Washington, Ottawa and leading segments of Brazil’s business community opposed Goulart’s Reformas de Base (basic reforms). Goulart wanted to expand suffrage by giving illiterates and low ranking military officers the vote. He also wanted to put 15% of the national income into education and to implement land reform. To pay for this the government planned to introduce a proportional income tax and greater controls on the profit transfers of multinational corporations. The military dictatorship’s assassination program has contemporary relevance. In 2016 Workers Party President Dilma Rousseff was impeached in a “soft coup” and the social democratic party’s candidate for the upcoming presidential election, Lula da Silva, was recently jailed. The night before the Supreme Court was set to determine Lula’s fate the general in charge of the army hinted at military intervention if the judges ruled in favour of the former president and election frontrunner. While they’ve made dozens of statements criticizing Venezuela over the past two years, the Justin Trudeau government seems to have remained silent on Rousseff’s ouster, Lula’s imprisonment and persecution of the left. The only comment I found was a Global Affairs official telling Sputnik that Canada would maintain relations with Brazil after Rousseff was impeached. Since that time Canada has begun negotiating to join the Brazilian led MERCOSUR trade block (just after Venezuela was expelled). As many Brazilians worry about their country returning to military rule, Canadians should demand their government doesn’t contribute to weakening the country’s fragile democracy.